Filmmaker Bert Marcus, Teenage Paparazzo (2010) & How to Make Money Selling Drugs (2013), explores the battle for the American Dream through the lives and careers of legendary boxers Mike Tyson, Evander Holyfield and Bernard Hopkins. Through illuminating, candid and never-before-scene interviews, these champions reveal their journeys from poverty and violence, through fame and fortune, to self-destruction and self-discovery. 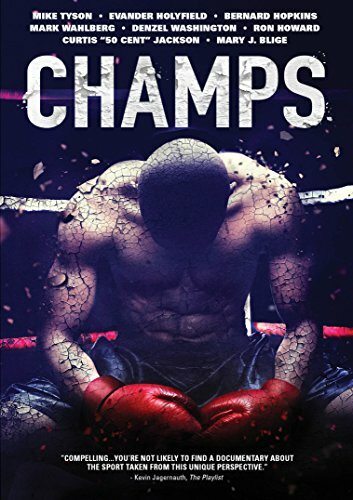 Featuring clips from classic bouts and observations from journalists, educators and A-list celebrity fans that have found inspiration from boxers in their own lives, including Mark Wahlberg, Denzel Washington, Ron Howard, Curtis '50 Cent' Jackson, Spike Lee and Mary J. Blige, the film uncovers the sometimes disturbing truths behind the controversial sport where the fight for glory is challenged only by the fight to survive. Champs truly transcends the sport of boxing.